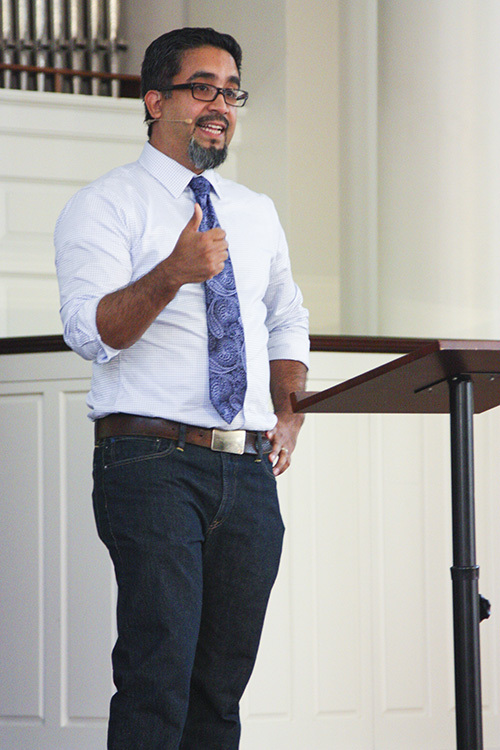 Two things are clear about the U.S. Constitution and its take on immigration, Samford University history professor Carlos Aleman told a convocation audience Tuesday, Sept. 17. "The federal government determines immigration policy and the 14th amendment confers citizenship to the children of immigrants, as long as those children are born in the United States," said Dr. Aleman. Aleman's remarks melded observance of Constitution Day, honoring the Sept. 17, 1787, adoption of the nation's founding document, and Hispanic Heritage Month, observed September 15 to October 15. An immigrant himself, the Nicaragua-born Aleman came to California at age 3 with his teenage mother and younger brother. He has recently applied to become a U.S. citizen. In the last few years, he said, some states, including Alabama, have challenged federal authority and attempted to regulate immigration by passing anti-immigrant laws. Alabama's anti-immigrant law, House Bill 56, passed in June 2011, for instance, requires police officers to determine a suspect's legal immigration status based on "reasonable suspicion." It also requires educators and employers to check on the immigration status of students and potential employees. A 2012 amendment, HB 658, added other provisions that made clear the law's intent was to shame people into leaving the state, said Aleman. "These laws promote rampant racial profiling against Latinos, as well as Asians, that presume someone to be foreign based on how they look or sound," he said. "This promotes the generalization that American means white." The Southern Poverty Law Center found that Latinos, regardless of their immigration status, have experienced harassment, hardship and discrimination as a result of HB 56, "and the xenophobic climate it has created," said Aleman. "Latinos from across Alabama report being cheated out of wages, being denied medical treatment and facing a growing hostility," said Aleman, who holds a Ph.D. in Latin American history from Michigan State University. He is in his first year on the Samford faculty, where he directs the Latin American Studies Scholars program. The law has possible negative economic consequences for the state, as evidenced by a recent study that projects a loss of as many as 140,000 jobs and as much as $10.8 billion in Gross Domestic Product and many millions in state income and sales taxes, and local taxes. Undocumented workers make up about 24 percent of the state's workforce in sectors such as agriculture, construction, accommodation and food services. Aleman noted that the report estimates that if 60,000 workers with an average income of $25,000 left the state, the economy would lose $5.8 billion, or 3.3 percent of the Alabama economy. Groups ranging from the federal government, through U.S. Supreme Court actions, to the Hispanic Interest Coalition of Alabama have resisted the implementation of these anti-immigrant laws, said Aleman, noting that HICA challenged the state law based on its violation of constitutional protections, such as unreasonable search or seizure, denial of equal protection and due process of law. "The Constitution is an incredible document in that it not only sets up our government and defines it, but it also protects our rights," said Aleman. Churches, he noted, have challenged the law based on biblical tenets, arguing that HB 56 "runs counter to the Christian spirit of compassion." "They ground their efforts in the Bible because God compels us to care for one another, citizen and immigrant alike," said Aleman, citing scriptures that stress being kind to strangers, loving neighbors and helping one another. "Love is the overriding message." Aleman said he was fortunate to arrive in the U.S. at an early enough age to attend school, learn English and avoid language barriers, eventually qualifying as a permanent resident. Yet, being raised in the United States, but a citizen of a country he had not lived in since he was a child created a paradox. On visits to Nicaragua, he was in essence, American, yet in the U.S. he was not a citizen and not fully American. There are many others like him, he said, who came as children and see themselves as Americans. "The only difference is that they do not have a legal paper that designates them as citizens, or like in my case, as permanent residents." "These are people who have come out of the shadows to struggle and demonstrate and clamor to be granted a pathway to citizenship so that they may become fully engaged members of American society. On the fiftieth anniversary of the civil rights movement, this is an inspiring act," said Aleman. He said he urges his history students to be active citizens, "to engage fully in this democracy." Ultimately, he said, caring about immigrants is about being a good person, a good neighbor, a good Christian, a good citizen and a good patriot. "It is about protecting what makes this country special."